If you look closely enough into Accolade's crystal ball, you'll see the future of home computer games. Conspiracy: The Deadlock Files, Accolade's first graphics adventure, features more than 500 digitized photographs of New York. If you've ever been to the Big Apple, you'll recognize Trump Tower and Saint Patrick's Cathedral among the landmarks. "We chose to do Conspiracy this way because we found a young man who had put together a technology that created on a PC something similar to CD-I-based games." said Shelly Safir, manager of product development at Accolade. Even though the graphics are fascinating, you won't have time to do much sightseeing a murder charge and uncover a conspiracy aimed at overthrowing the U.S. Government. Don't worry if it seems that somebody is following you. It's just the FBI, the CIA and the KGB. All those digitized graphics add a striking sense of realism and urgency to the chase. Although you might expect this program to take up a lot of disk space and RAM. Safir said it would probably be a six-disk game and would require only 512K of RAM. "The challenge was finding a good compression routine, and we think we've found one," Safir said. In VGA, the uncompressed graphics are very sharp, but the game is also compatible with lower-resolution cards, including CGA and Hercules graphics cards. Tandy owners will be able to take advantage of Tandy's 16-color card and sound chip. Conspiracy also works with the CMS sound board and the Ad Lib board. "We're taking a big step in the direction of interactive movies with this product," said Safir. "We're opening doors not only for Accolade, but for the whole entertainment industry with a new approach." 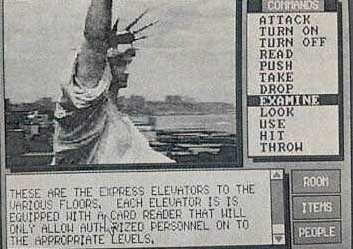 The PC version will retail for $49.95 and is due to be released in the third quarter of 1989. For information, contact Accolade at 550 South Winchester Boulevard. Suite 200, San Jose, California 95128: (408) 296-8400.